A few months ago, having just come off a particularly arduous day of cleaning (of course Gigi would shorten her nap on the day I had set aside to clean the house that week), my mom-friend passed me the number of her cleaning lady while we waited for our boys at school pick-up. Intrigued, I took the little slip of paper–but with so much guilt you’d think I was buying elicit drugs in an alley somewhere. When I told Mike I had the number, he was all for it–most likely because he is witness to my cleaning woes on the daily (I feel like I spend my entire day some days straightening, sorting, putting away–nevermind having the time to actually clean surfaces). “It is,” I thought, thinking of all the time I’d have to dedicate to other, more meaningful pursuits. So, why the guilt? Because I’m a stay-at-home mom right now, and I am supposed to be able to play with/nurture/teach/protect our kids, all while cooking, tracking our budget, working on some freelance stuff, blogging, grocery shopping, and, of course, cleaning. I was booked back-to-back all day, every day (with tasks so mundane, that I resented executing them), so I’d panic when someone spilled on the floor, for instance, because it meant I had wasted my precious time. Let’s just say, my role as housekeeper and the vision of the chilled-out, carefree mom I wanted to be, were at odds. So when I was asked to test out Pine-Sol’s new Spring Blossom scent, I knew that I might not be the one actually using it, but decided to see how it went. As suspected, the lovely woman who now whips our place into shape every second week, is the one who initially opened the bottle, and I got to experience the thrill of walking into an apartment that was not only squeaky clean, but that smelled great too. I have since used Pine-Sol Spring Blossom several times as I chip away at the spring cleaning; wiping down closet shelves as I switch everyone’s winter wardrobes out for spring/summer, cleaning walls and baseboards and all the nooks and crannies that tend to get ignored over the winter, and cleaning the floors, because even with someone to help us out with the cleaning, we have kids :). As for the state of affairs when it comes to keeping house around here, I am definitely more relaxed and a little nicer, if I’m being honest. 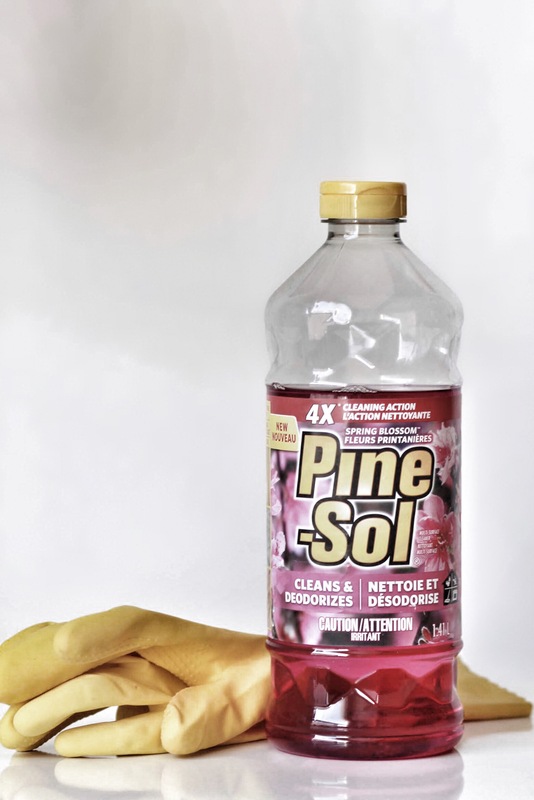 Viggo no longer approaches me with trepidation when he’s had a spill and I have more time to play with Gigi during the day (who, I should point out, is a big fan of Pine-Sol Spring Blossom for its bright, pink colour). I’ve even managed to make headway with the growing pile of New Yorker magazines on my side of the bed. Cheers to that! 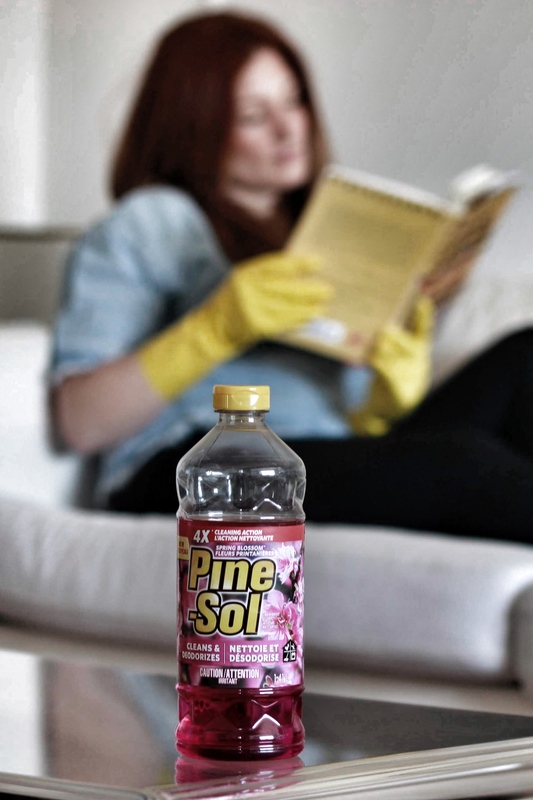 *This post was sponsored by Pine-Sol but all opinions are my own. I can’t tell you how many times I’ve toyed with the idea of getting a cleaning lady. Again, no kids over here but still my days are filled up and crazy busy. I feel like I have less time now that I did blogging and working full time! We’re still holding off but maybe one day! You should do it! It has been so great–and I love ours for helping me so much. Because we’re moving, I had to say good bye to her last week and it was really sad. Anyway it has added so much to our lives–really. Less stressing by me about getting it done, I’m less antsy about the kids making a mess, and ours was so lovely, to boot. I highly recommend!